Relieves Dry, Itchy, Irritated Skin due to: Dry Skin, Rashes, Diaper Rash, Chicken Pox, Eczema, Insect Bites, Poison Ivy/Oak/Sumac. Soothes: Diaper Rash and Chicken Pox. Aveeno Baby Soothing Bath Treatment is made with natural colloidal oatmeal - a long recognized ingredient that relieves dry, itchy and irritated skin. 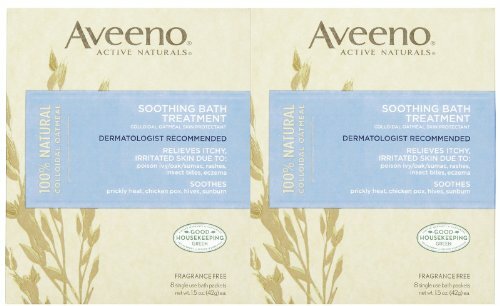 In this unique Aveeno formula, colloidal oatmeal is combined with a special moisturizer and milled into an ultra-fine powder. When dispersed in water, this powder forms a soothing milky bath. After bathing, you baby's skin becomes softer and smoother, and dry, irritated, sensitive skin is relieved. Aveeno Baby Soothing Bath Treatment works as a natural cleanser and cleans the skin without soap. Surface soils adhere to the ultra-fine colloidal oatmeal particles and gently rinse away. The special emollient leaves skin moisturized. And it's hypoallergenic so it's even gentle enough for sensitive skin.